The paired occipitalis muscles are thin and quadrilateral in shape originating by the tendinous fibers from the lateral two-thirds of the superior nuchal line and from the mastoid part of the temporal bone. They travel a short course after which its fibers insert into the galea. A space, which leaves between the two occipital muscles, is filled by a posterior extension of the epicranial aponeurosis. Branches of the posterior auricular and occipital arteries supply each occipitalis muscle. They are innervated by the posterior auricular branch of the facial nerve. 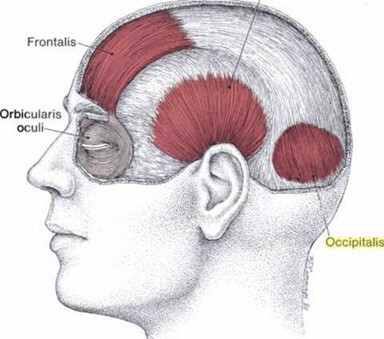 The occipital muscles act to move the scalp backward. Mesoderm of second pharyngeal arch. Lateral 2/3rd of superior nuchal line. Posterior auricular branch of facial nerve. It pulls galea aponeurotica backwards. It is a tough membrane. It connects frontalis and occipitalis muscles. The skin is firmly connected to the galea aponeurotica by dense connective tissue. Transverse injuries of the aponeurosis is essential for gaping of the scalp wound. An active trigger point in the occipitalis muscle belly lies in a small hollow just above the superior nuchal line approximately 4 cm (1.5 inch) lateral to the midline. Spot tenderness is located by flat palpation. The frontalis responds poorly to stretch and spray because the muscle is so difficult to stretch. It does respond well to massage and/or to pressure release of its trigger points (TrPs). The same treatment may be used for trigger points in the occipitalis muscle. Deep massage of TYPs in this muscle is effective and also has been recommended by others.